Did you know? 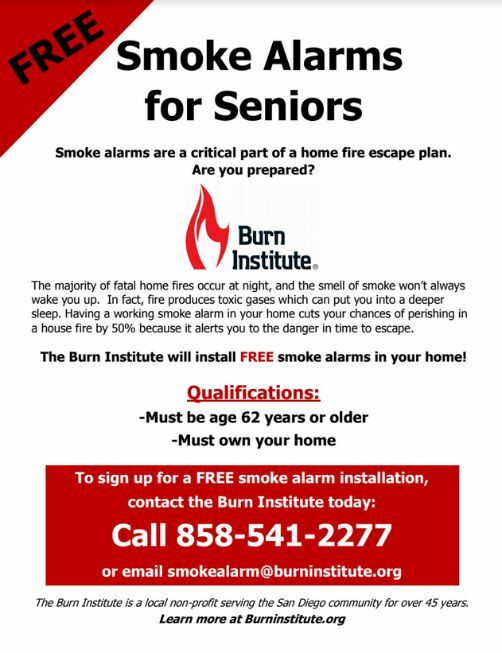 The Burn Institute in San Diego has a special program that provides free home smoke detectors/alarms to seniors over 62 years who own their own home. A representative from the Burn Institute in San Diego, Ms. Susan Day, attended SVCA’s recent meeting on October 3rd, where she discussed this program with us. Ms. Day stated that the Burn Institute would provide smoke alarms with 10-year lithium batteries and even send people out to install them free of charge. Smoke alarms would be placed in every sleeping area and on every level (floor). When the smoke alarms are due to be replaced in 10 years or so, the Burn Institute would again send people out to replace them free of charge.